Welcome to one of the most highly anticipated weekends of the Ontario winter university sports season — the Wilson Cup! Wait, I meant the Queen’s Cup! Oh, I forgot, there’s also the women’s basketball newly created “Final Four” this weekend, right? And doesn’t women’s hockey have their winner-take-all game this weekend, too? 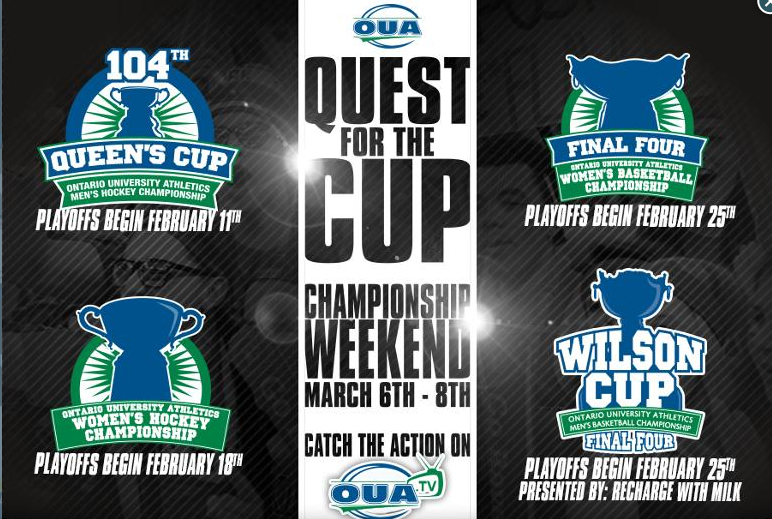 The OUA has decided to approach the championships of hockey and basketball differently this year — throw them all on the same weekend, Mar. 6-8, with plenty of hours of “coverage” on OUA.tv. This means a few things for me: I’m infinitely grateful to my parents, who got me an HDMI-to-MacBook adapter so I can hook my laptop up to my television. That way, I won’t fail my last few university courses from watching these “plenty of hours.” It also means that if anyone wants to contact me, it’s best to do it in the form of a 24-pack of beer so I can make it through all of these games. But most importantly, it means I’m going to have to choose between four really awesome championships for what I want to watch. Are you overwhelmed? Me too. The OUA is marketing this “super” championship weekend as this amazing thing for all of the coverage that will be happening during OUA.tv’s first year of implementation, but are splitting not only their viewership, but also their own resources. To my understanding, the OUA usually sends representation to each of these tournaments to present the championship trophy and help with marketing and communications. But with all four championships around the same time as each other, and all in different cities, how in the world will they do this effectively? Additionally, the OUA lost their Sportsnet contract earlier this year because of a lack of interest. The provincial championships for basketball and hockey generate a lot of buzz in Ontario and rightfully deserve the attention. But now we’re splitting attention across so many fields that it’s overwhelming. Sure, there’s the "split screen" option on OUA.tv. It is actually possible to watch all games going on at once through that option if you’re not there. But what if people want to listen to all of the commentary? What about those who actually enjoy going to the games? What about the athletes that want to support their counterparts? At Wilfrid Laurier University, the women’s basketball team would go to the women’s hockey games to support the ladies, and the hockey team would do the exact same for basketball the next day. I’m sure it’s the same throughout the province, so why make the athletes choose which team they favour? If you really want to, you can look at the CIS doing the exact same thing for their national championships a week later. The finals will all be on Sportsnet U — which, don’t get me wrong, is huge for Canadian university sport —and will host “30 hours of CIS basketball and hockey” on Mar. 14 and 15, but will create tension between the sports and the viewership. There’s so much happening at once that this “super” championship weekend will overwhelm amateur fans and make long-time fans and athletes annoyed with the lack of attention to the finer details of the four individual sports. I encourage you to take in all of the action that will be happening. The province’s stellar athletes deserve the attention regardless of the ignorance that went into making this weekend. As for me, I’m going to pull a sport out of a hat to decide who gets my focus. It might be interesting to talk to the folks that decided this format was a good idea. I'd assume that the OUA super weekend was necessitated by the way that Rogers was going to be covering nationals. However, perhaps the schools, conferences, and broadcaster are trying to achieve something here; making university sport a wall to wall reality for a weekend. Although its possible that the interested parties are trying to achieve some type of synergy with this format, as you've shared, I kind of have a feeling that the rationale is akin to swallowing bitter medicine or ripping off a band aid. It feels like the national broadcaster wanted to get all this "CIS stuff" out of the way, forcing the OUA to schedule this weekend's provincials as such. I hope I'm wrong; I hope its more about a marketing and scheduling strategy that's intent is to grow interest. In any event, talking to the guys who gave the go-ahead could shed some light on what the larger plan might be. Keep that bull sh** detector at the ready.